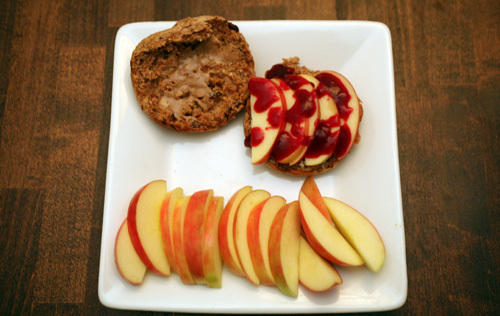 Breakfast: Ezekiel Cinnamon Raisin muffin with 1-1/2 tbsp almond butter, sliced apple and cranberry ketchup! Oh my...this was delicious! 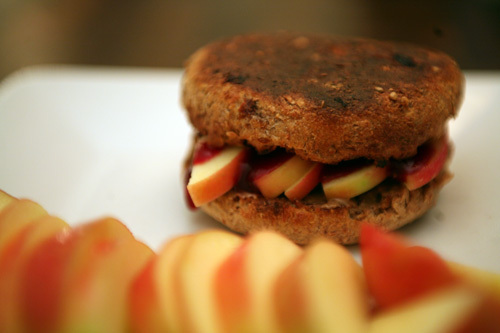 I love the Ezekiel Muffin/nut butter/fruit combo...it keeps me so satisfied! 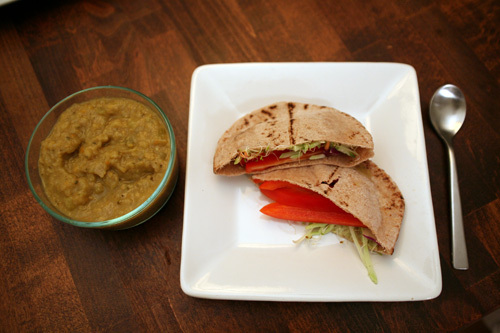 Several of you have asked for the cranberry ketchup recipe, which I got from Erin at Care To Eat. I've asked her permission to post, so if she says yes I will hopefully have it up tomorrow! If you can't wait though, just send her an email and I'm sure she'll give it to you, she's a sweetie! Snack: I'm in fridge/freezer/pantry clean-out mode, and it was driving me crazy this morning that I had just a little Kashi H2H left in the pantry but didn't want cereal for breakfast. So, I added it to the trail mix that the hubb made me last week and brought the tub to the office to live. 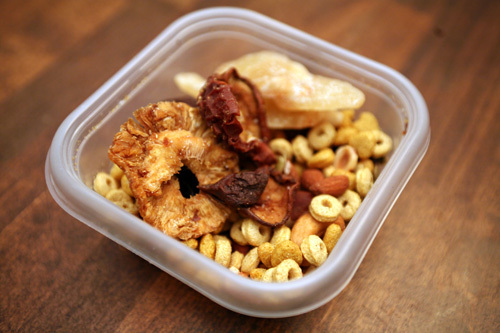 It contains: Kashi H2H, mixed nuts, dried cherries, pineapple and pears, and crystalized ginger. 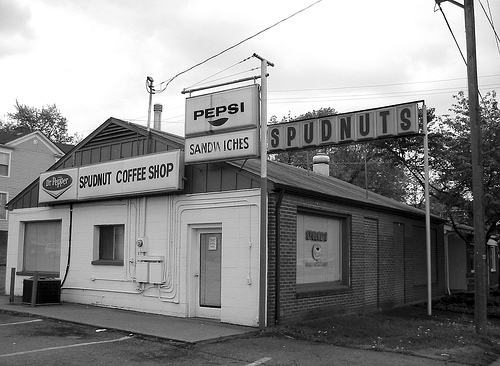 I had about 1/2 a cup of the small stuff and one dried pear. 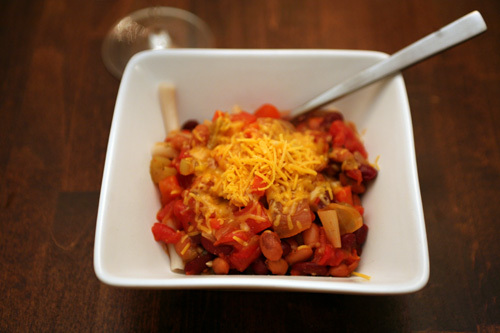 Dinner: Veggie Bean Chili a la my hubb...he's the best! We had it over brown rice pasta, with a little sprinkling of cheddar on top. 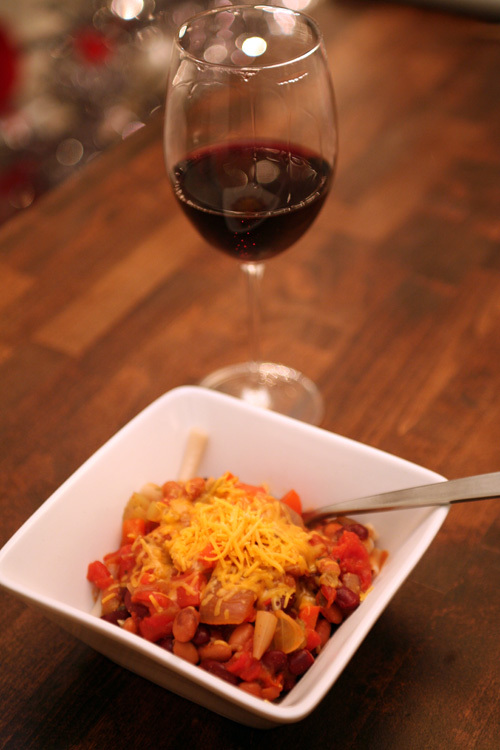 I also had a glass of Meridian Cabernet...this is one of our favorite wines for every day. I know you're all really busy too and I hope that you all accomplish the enormous lists that you've made yourselves!!! What's on your agenda this weekend? PSS: The vote was unanimous...no summary posts! Thank you all for the great feedback, I just didn't want you annoyed by slow page loading but it doesn't sound like thats a problem, so I won't change a thing!